Vantage Pro2 weather stations include a display console and the innovative integrated sensor suite, which combines rain collector, temperature and humidity sensors, and anemometer all into one package making setup easier than ever and improving performance and reliability. Includes 100' (30 m) cable from sensors to console. 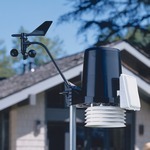 View monthly or yearly rainfall or rain rate.